BikeSafe is a police led motorcycle project that is run by most forces throughout the UK, including Northamptonshire. The main aim is to reduce the number of bikers being hurt on the roads. Interested in knowing what a professional rider would say about my riding style, I registered and paid £60 (as of May 2014) to spend my Sunday with PC Mark, PC Jason, John, Kevin, Ian, Mark, Paul, PC Andy and PC Nick (I'm in the middle). 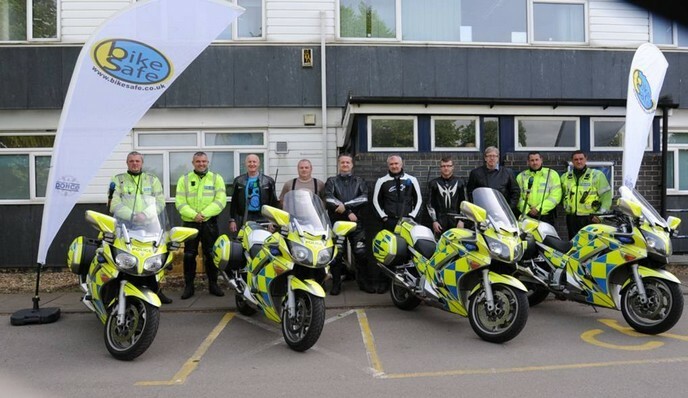 All of the officers assisting on BikeSafe are Police Class 1 Advanced riders from the forces motorcycle section, accredited for delivery of the BikeSafe course. The day started bright and early, arriving around 7.45 am at the Police HQ, Mereway, for a planned 8.00 am start. After the cup of tea, introducing ourselves, paperwork, presentation of the course, Rob (not pictured), a specialist paramedic from the fire brigade, taught us some basic first aid techniques, such as how to safely remove a helmet from an injured rider, although the main objective of the talk was to teach us what to do in the event of an accident where we are first on the scene. In this respect, it is suggested that you download and install the application P.A.N.I.C. if you have an iPhone, Android or BlackBerry mobile phone (click to open the corresponding app page, and check the app presentation video below), as it contains a lots of useful information laid out in a logical manner. With this app, you have all the steps to follow, whilst being able to guide the response team when they are on their way. After about one hour on first aid, PC Mark and PC Andy started talking about the BikeSafe course itself. The whole purpose of BikeSafe is to reduce casualties among bikers by passing on tips and knowledge, to give you an insight to safer, smoother riding, and a heightened awareness of possible hazards. To that end, the workshop explores the main riding hazards that you as a biker face. By delivering theory presentations and observed rides, a BikeSafe workshop will help you discover your strengths and weaknesses and also where to go next to develop and get more from your biking. Another 90 minutes on theory or so, such as positioning on the road, cornering techniques, the difference between filtering and overtaking, a few videos on how not to ride, and we were ready to go for our first ride of the day. With 6 students for 4 police riders (each course take a maximum of 8 students), the two who had the most recent licence had their own instructor, whilst the other four were grouped as 2 riders for 1 instructor. We set off towards Towcester, the instructor sandwiched between both riders, each rider taking it in turn to open the road so the instructor could observe the former's riding style with a view to comment on the rider's technique. It is true, Northamptonshire contains some of the top motorcycle riding A and B class roads in the country! Guided by PC Mark, we got to ride on all types of roads, and ended up at the Super Sausage Cafe on the A5 after about 90 minutes riding. We had a nice pit stop for food and drink, talked about the first ride, and went on our way for the second ride of the day, getting back to the Mereway HQ around 4.30 pm. The day finished with a quick debrief, mention of follow-up courses a rider can do (Institute of Advanced Motorists, Royal Society for the Prevention of Accidents, Enhanced Rider Scheme), and we took the picture you can see above. So what about the course, useful or not? To be honest, as an experienced rider, I cannot say that I learned a lot on the day. However, I am glad I got to do the course. If anything, it was useful to get confirmation from a professional rider that my riding style is OK with him, and that he considers me to be a safe rider. Good to know you are doing the right things! Plus, a quick refresher on theory and pratice never goes amiss anyway. This course would be most useful for those who got their licence fairly recently, young riders, or those who are returning to riding motorcycles after a long pause. To prepare for the BikeSafe course, you could also read the book Motorcycle Roadcraft: The Police Rider's Handbook to Better Motorcycling, an essential read in my opinion (about £11 from online shops). Remember, the more training you get, the better and safer the rider you become! You can get more info on BikeSafe in Northamptonshire by clicking here.